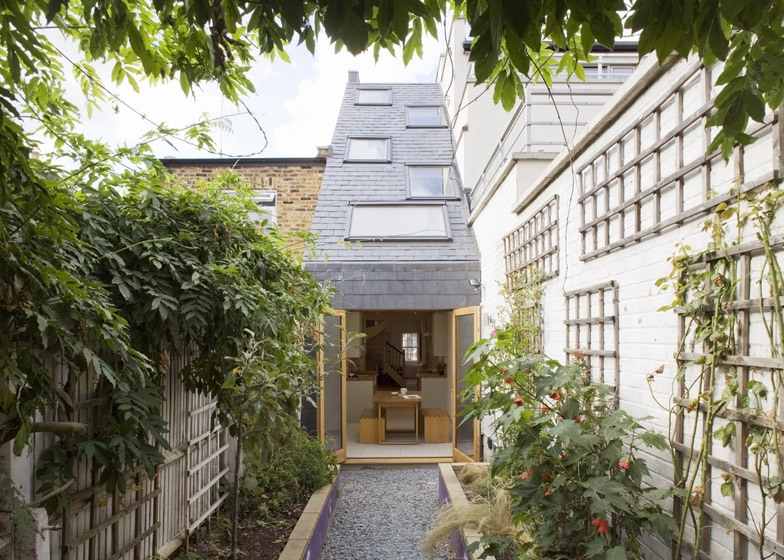 London studio Alma-nac has staggered the floors of this extension to a 2.3 metre-wide terraced house in south London to help bring natural light in through a sloping roof. The narrow house is located in the former stable access between two properties and suffered from poor natural light due a lack of outward-facing walls. "With such a narrow and deep plan the existing building was claustrophobic," alma-nac partner Tristan Wigfall told Dezeen. "The key driver in developing the proposal was ensuring that natural light was able to penetrate deep into the plan to create rooms that felt spacious and light." The architects extended the house at the rear, then added a gently sloping roof dotted with skylights to allow natural light to enter rooms on each storey. This addition allows space for a new ground floor dining area, an extra bedroom on the first floor and a study on the second floor. Floors on the two upper storeys fold up to meet the new roof at a perpendicular angle. "One of the key aspects was cranking the floor plates so that the main rooms, orientated towards the southerly rear of the property, had increased head-heights and improved the outlook to the garden and sky," said Wigfall. Storage was a key consideration and the architects have added a new dressing room on the first floor, a loft above the top floor and even a cupboard behind the head of the bed. Slate tiles clad the walls and roof of the extension. "We liked the idea of the material continuing from the slope of the roof on to the vertical rear facade," added the architect. An oak-framed door punctures the slate surface and leads out from the dining area to the garden. Other recently completed house extensions in London include a house with a wall of books and an orangery with an oak-screened staircase. See more residential extensions on Dezeen. Alma-nac were approached by a young couple in order to investigate the possibilities for extending and enhancing an existing terraced house on the busy high street of St John's Hill, Clapham, London. The uniquely narrow property, measuring just 2.3m internally throughout, presented certain challenges in reorganising the spaces. This was coupled with a strict budget within which to work; the property had been re-valued since the original purchase and the bank loan was based on the difference of the increased value. It is understood that the location of the property was the original stable access to the rear of the high street. The resulting narrow proportions meant that the centre of the house was dark and gloomy. The building was laid out over three floors with cramped bedrooms facing on to the noisy high street and small sash windows of the study and bathroom to the south facing rear. At ground level the entrance lobby doubled up as a dining room and a piecemeal existing rear extension gave limited access to the garden through the kitchen. The neighbouring property, an art gallery and studio at ground level and apartment above, had extended almost to the full depth of the plot with a terraced rear facade. An immediate response might have been to continue this form with a series of terraces forming the new rear facade. However, the complexity of constructing multiple terraces and roofs meant that this option was deemed prohibitively expensive as well as proving problematic in terms of bringing light into the centre of the plan. A response to this was to form a continuous slate-clad sloped roof creating a simple and easily understood construction method. This material treatment is continued on the rear facade and reflected in the slate shingle ground cover of the rear garden. In order to enhance the sense of space within the newly formed rooms the floor plates at each level were cranked, allowing an increased floor to ceiling height and encouraging light to penetrate deep in to the plan. A light-well was formed over the central stair by opening up the ceiling to the sloped roof. This allows natural light to flood deep in to the plan at first and second floor levels and provides a natural stack effect when the rooflights are opened. The brick flank walls are left exposed at the top of the stairwell to convey the original building roof shape. A key consideration was storage space and every corner of the property has been utilised, from the bed-head with integrated storage, loft space over the top bedroom and compact bathroom layouts. The elongated form of the main bedroom at first floor level allowed for the creation of a dressing room area so that the bedroom space remains uncluttered of furniture. The design of the roof build-up ensured the minimum depth (250mm) in order to maximise the space internally and achieving a high U-value (0.14 W/m2K). The staggered window pattern on the rear elevation plays with the scale. The rooflights are organised to allow views through to the exterior along the corridor side and to illuminate the top section of the sloped ceiling.